In geek circles, I think it's safe to assume that the vast majority of readers recognize and respect Neil Gaiman as a master storyteller. The man is absolutely brilliant and it amazes me how he is able to write stories for different audiences and yet maintain the same level of quality. I'd be happy to be even half a good a writer as Gaiman. The Sleeper and the Spindle is a rather different take on some familiar fairy tales. More than just some basic "reimagining" of things, it's also a serious attempt to get out of the old gender stereotypes of fairy tales - in particular the whole "damsel in distress" deal. The fact that this is meant more for children in terms of tone, design and the presence of illustrations says a lot about the impact of this story. I can imagine some folks objecting to the way things were handled here given how our sleeping beauty is awakened by a kiss from another princess, but I strongly feel things were handled in a rather tasteful manner. But I'm putting that fact out there this early in the review since a lot of media folks have jumped all over this aspect of the book. 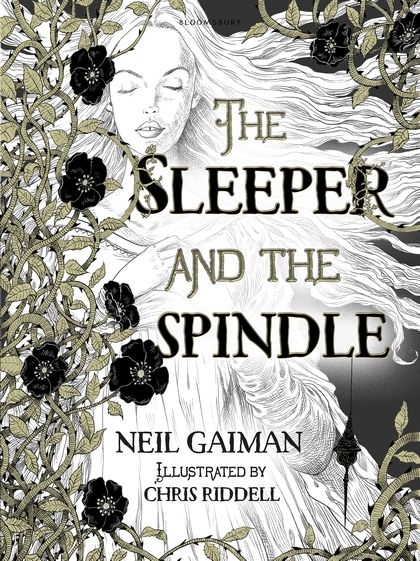 Synopsis: The Sleeper and the Spindle is an illustrated fantasy novel by Neil Gaiman. Illustrations were provided by Chris Riddell, who also worked on the other Gaiman books such as Coraline and Fortunately, the Milk. The story involves two kingdoms separated by an impassable mountain range. When the young queen of one kingdom hears that a sleeping enchantment cast on the neighboring kingdom's princess seems to be spreading beyond the castle, she decides to put her wedding plans on hold in order to investigate the trouble. Accompanied by a few of her loyal dwarfs, they journey into the dwarf tunnels underneath the mountains to cross over to the other kingdom. Thus she and her companions make it to the kingdom with more and more people falling prey to the magic of the sleeping enchantment. They persevere past the massive hedge of thorny vines that protects the castle in order to investigate what is going on. And when the queen encounters the sleeping princess, there's far more to this little mystery than as it first appears. And how the story resolves is pretty brilliant. As I was writing the summary of this story, I realized just how short the actual story is. But it didn't feel that brief while reading it - and I suppose that just shows just how powerful the story was. Between the tale crafted by Gaiman's words and the beautiful Riddell illustrations that go with the story, the overall experience was quite magical indeed. The queen, implied to be the equivalent of Snow White, makes for a great protagonist. She has clearly survived an ordeal of her own that has forced her to become a lot more independent. And as a queen, the dwarfs clearly show her a lot more respect and are prepared to make the dangerous journey with her. And whether this respect is only the result of respect for her title or respect born out of past experience together. And all that generally lines up with the original Snow White narrative in a clever manner. The ambiguity about all this and the different clues and references to the past all make things more compelling. Then you get the story of our sleeping beauty itself and the nature of the curse wished upon her. There's the added fact that it is believed by most that the witch who cursed her remains in the castle - something that isn't usually stressed in the old stories. Admittedly I didn't think too much of this change at first, but then when the old woman remained an active character once the queen reaches the castle certainly made things a lot more interesting. The twist at the end was probably predictable to a lot of folks, but I'll admit that I didn't quite see it coming. I was content to just enjoy the narrative as it was presented and followed along with every turn of the page. And on the whole it just makes for a beautiful little fantasy experience. And the bit about the queen being capable of saving herself and others? Don't think too much about it. You can try to raise any number of objections for that one panel where she tries to wait the sleeping princess with a kiss, but it won't really matter. This isn't a romantic kiss nor do we declare that the queen is somehow gender queer or something. She's engaged to be married to some undeclared individual. And let's just leave it at that. Like most fairy tale characters, we only know what she does in the story and all other back story and such is left to speculation. The Sleeper and the Spindle is a beautiful tale in terms of both narrative structure and art. And as much as it is said that you shouldn't judge a book by its cover, this book has a stunning one and it just sets the stage for a wonderful adventure that's a little dark but not overly so. The book gets a full 5 surprise revelations about the characters out of a possible 5.